Marriott International will open its first property in Serbia next month. 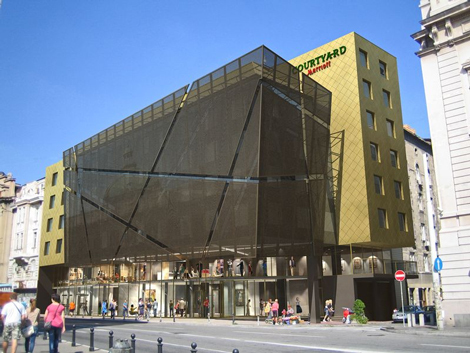 The 114-room Courtyard Belgrade City Centre will be located in the city’s Republic Square, close to the shopping and restaurant district of Knez Mihailova, and the capital’s Bohemian Quarter. Rooms will feature free wifi and 42-inch Smart LED TVs, and other hotel facilities will include a meeting room, 24-hour market shop, a fitness centre and all-day dining restaurant. As can be seen in the image below, the hotel will feature a glass façade looking out onto Vasina Street and Republic Square, the location for the city’s National Museum and National Theatre. Air Serbia offers direct flights from London Heathrow to Belgrade, while Wizzair flies from London Luton.